WORCESTER – Standing on Commercial Street watching scenes being filmed for the Liam Neeson flick “Honest Thief” on Monday morning, Jackie Giaquinto of Ayer said she was there for one reason. “I’m hoping for a Liam sighting,” she said. Ms. Giaquinto, a former Worcester resident, had the day off and headed to downtown Worcester to check out the filming. She is a fan of Neeson, known for his roles in “Rob Roy,” “Gangs of New York,” and the “Taken” series. Scenes of “Honest Thief” are being filmed in Worcester and Oxford, among other locations. There were no Liam Neeson sightings during the day, but plenty of action, especially on Commercial Street, between Mechanic and Front streets, next to CVS Pharmacy. It was unclear whether Neeson would be in the scenes shot in Worcester. At Front Street, several takes were filmed of people in a crosswalk and a car speeding down Commercial Street toward the DCU Center. 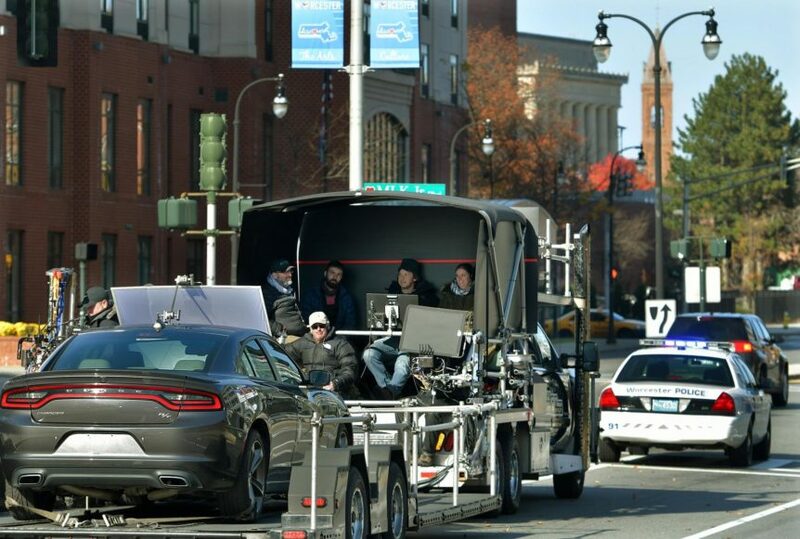 Close-ups of the car also were filmed as it was towed around the city on the back of a trailer. Plans to use the car in a stunt never materialized by the end of filming for the day. The film crew used the Wachusett Brew Yard behind the Railers Tavern on Commercial Street as a staging point. The cast also used a room on the first floor of the Mercantile Center for breaks and as a gathering place for extras. Ms. Giaquinto was among a handful of people observing the activity at the various locations Monday. Ricky Marko of Worcester also took time to check out what was going on. He was driving by when he saw the filming taking place and stoped to check it out. © TEXT Mercantile Center. All Rights Reserved.